Photo: is proud to announce the Recipient of democraSEE 1. Senga was born in Lubumbashi in 1983, where he lives and works. His work considers the conflicted terrain of identity, heritage and history and how it intersects with memory. He presented Footprint at the 2009 Rencontres Picha Biennale de Lubumbashi and subsequently developed series of works including Kadogos, A life after death and recently Cette maison n’est pas à vendre et à vendre. His work has been shown at the Rencontres de Bamako, Kamapala Biennale, Mu.zee in Oostende amongst others. 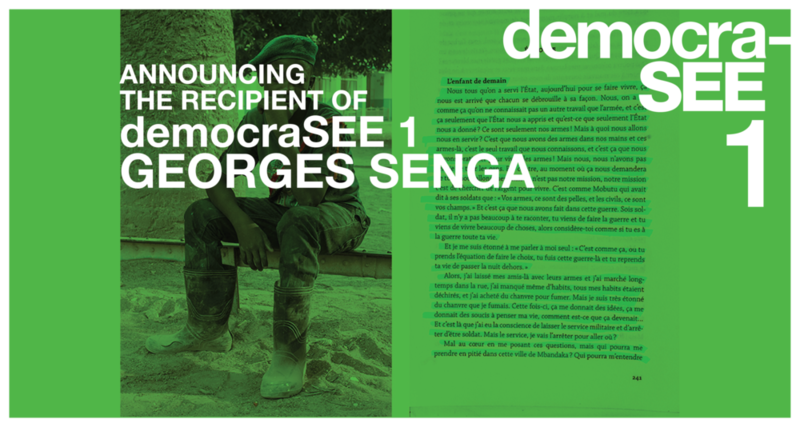 Senga was announced the recipient of the award at the Rencontres de Bamako, Biennale of African Photography, Mali on 4 Dec 2017. The shortlist included Jody Brand and Matt Kay. For more information about the selection panel, please see below. Senga’s ease at finding interesting stories that are right here, next to us, and make them into strong narratives is notable. For instance, in Kadogos, boys become soldiers in simple games - just playing. But it talks to the violence that the country (DRC) is going through – society is preparing boys to fight, not protecting them. Senga shows great breadth of practice and skill, with a sophisticated multidimensional approach to his work and a beautiful photography proposal for democraSEE. It is fascinating how Senga taps into memory. Even though the project is about a simple place it works as a metaphor for many larger more complicated issues –colonialism, history and the place and role of image - in a poetic way. It is clear that the photographer has a great tone in his visual language. Beyond the poetics of his work, there is a real urgency about the world that he deals with. His use of metaphors, allows us to engage with this hard world. The selection panel for democraSEE consisted of leading regional and international experts: Sammy Baloji, Dana Whabira, Mauro Pinto, Ingrid Masondo and John Fleetwood.